The temperament of a Schoodle depends quite a lot on the characteristics of the ones of the parents. The gentleness, easy-going and affectionate nature ensured that the Scoodles become popular. Supple dogs, they are also very energetic and love being active. There is a chance that they act aggressively towards other dogs, but in order to prevent this an early age training is highly recommended. Despite their occasional aggressiveness towards other pets, they manage to behave very affectionately with people. Keeping the daily exercising at a good level, combining both indoor and outdoor activities is very good for these active hybrid dogs. Sociable animals, they will suffer when they are left alone just as much they will enjoy the company of their owners. Training the Scoodles needs to be accompanied by the understanding of the fact that both the Scottish Terrier and the Poodle have influenced their natures. It is of utmost importance to comprehend that it is equally important to correct these dogs when they did something wrong and to praise and reward them when they are doing things right. Even if they can inherit the coat characteristics from both parents, most often the Scoodles inherit these from the Poodle side of the bloodline. This means that they will have curly coats more often, which will need a daily brushing session in order to keep it clean and prevent tangles. Although bathing is recommended, it is not to be carried out daily, as the natural oils will be eliminated from the coat level and will just leave it with a bad look, dry and an overall unhealthy condition. These dogs are active animals, enjoying a lot a daily session of playtime alongside their owners. With a solid build, they often act fearlessly. They are clever dogs and have independent and tempered nature, which allow them to learn things quickly and easily. 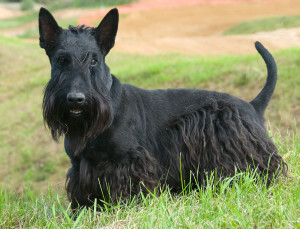 However, the Scottish Terriers do have a tendency to be stubborn at times, which will require to be dealt with by the trainers with patience and consistency. They need to be properly socialized in order to prevent aggressive behavior towards other pets. There are three different varieties of Poodles, depending on the size, which can further determine the same categories in the Scoodle. These are the Miniature Poodle, with a maximum weight of 8 kilos and a maximum height of 40 centimeters, the Toy Poodle usually measuring no more than 25 centimeters and 4 kilos and the Standard Poodle, the biggest of the three, reaching up to 30 kilos weight and 40 centimeters height. Concerning their intelligence, it’s important to know that Poodles are on the second place in a worldwide top. Obedience training is no match for the Poodles, also being very fond of pleasing their owners, also using tricks sometimes. Friendly in nature and pretty attached to their owners, the Poodles will suffer if left alone, but will exalt when kept in the center of attention. Poodles proved to be an excellent choice as house pets, as they also get along very well with children. The smaller varieties are more recommended to families with older children. Poodles are not the excessive shedding type, as they have a dense, curly coat. Grooming is required every six to eight weeks and helps prevent occurrence of mats and tangles. There is a variety of colors a Poodle’s coat can be, including black, apricot, gray, blue, silver, brown, white, red, cream and multi-cored. The low level of shedding grants the Poodles a hypoallergenic status, very suitable for people with dog related allergies. 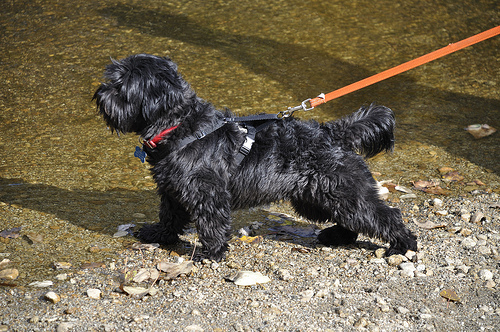 These dogs will enjoy any activity, as long as they are accompanied by their owners. 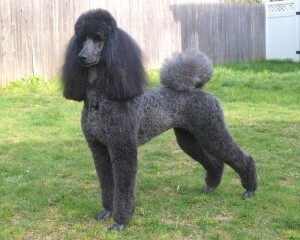 This entry was posted in Poodle Mix, Scottish Terrier Mix. Bookmark the permalink. I have found a Scoodle in the pownd and now have him as my compaion at home and as I travel for work ! He is the best dog ever! Loving and loyal as the day is long ! He loves our time in the woods walking or hunting ! Will flush both bird and rabbit and give chace !